The manhunt continues for two carjackers who drove a stolen SUV into a crowd of people in North Philadelphia Friday morning killing three children and injuring three adults. 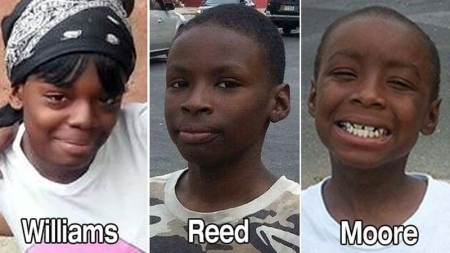 The children have now been identified as 15-year-old Keiearra Williams, 10-year-old Thomas Reed and seven-year-old Terrence Moore. Their mother, 34-year-old Keisha Williams, remains in critical condition. Their family friend, 69-year-old Thelma Brown, was also seriously hurt. The final victim was the woman who was carjacked. She is critical but stable. She was forced into the back seat at gunpoint after showing a real estate property and was still in the vehicle as it crashed. The reward for information leading to an arrest and conviction is now $110,000. The city is offering $100,000 and the Fraternal Order of Police added $10,000, however the men must be in custody by noon on Monday to receive the extra $10k. The children and their mother were helping Brown sell fruit on the corner of Germantown and West Allegheny to raise money for their church, Eagles Wings Evangelistic Church. At around 11:15 a.m. the stolen Toyota came through the intersection at a high speed, blew a tire, and crashed through the fruit stand. The vehicle then went across a grassy area and slammed into a tree. The two suspects fled on foot. They are described as a black male and a hispanic male in their 20's. At least one of them is armed. There is a good chance that they have been injured from the crash. If you have information call Philadelphia Police at 215-686-TIPS (8477), text police at PPDTIP (773847) or submit a tip online at PhillyPolice.com. A woman was rushed to the hospital Saturday morning in Northeast Philadelphia after a propane tank exploded inside a RV while she was cooking. It happened sometime just before 10:30 a.m. on E. Cheltenham Avenue and Oakland Street in the city's Oxford Circle section. The 36-year-old female was inside the moving RV cooking when the tank exploded setting the vehicle on fire. She suffered serious burns to her legs and hands. The woman was taken to Temple Hospital and is in critical condition. A 5-year-old boy suffered minor scrapes on his legs but was not taken to the hospital. Two others inside the RV were not hurt. Crews were able to extinguish the flames quickly. Authorities in Delaware County have found two more guns in the home 49-year-old Richard Plotts. Plotts is currently under sedation and recovering from his own gun shot wounds. The felon and mental patient is accused of killing his case worker, 53-year-old Theresa Hunt, and wounding his doctor, Dr. Lee Silverman, before being shot himself by Silverman acting in self defense. District Attorney Jack Whelan says he won't be arraigned on murder and attempted murder charges until he wakes up. Authorities seized two additional guns and a laptop computer from his home in Clifton Heights. Right now authorities believe that Plotts was angry with Mercy Fitzgerald Hospital's posted “gun-free zone” signs prompting him to bring his handgun as well as 39 additional rounds to his appointment of Thursday. They say if it wasn't for Silverman shooting back and two other employees wrestling him down, Plotts would have killed many more.